“No one’s actually making money from coal-fired power plants in the United States right now,” said David Crane, former CEO of NRG Energy, one of America’s biggest power companies. That may seem a strange sentiment coming from a man who led a Fortune 200 company owning more than a dozen coal-fired power plants. But then again, Crane is far from your typical energy exec. During Crane’s 12-year run as CEO, he tried to transform NRG—then America’s fourth-largest carbon emitter—into a firm focused on wind, solar and nuclear power. The company made strides in that direction, but Crane was ultimately let go earlier this year. Yet even after that setback, Crane remains dedicated to reforming the U.S. power sector. Crane shared his views at WRI’s MindShare event, a two-day conference that brought together sustainability directors and other business leaders from our Corporate Consultative Group. 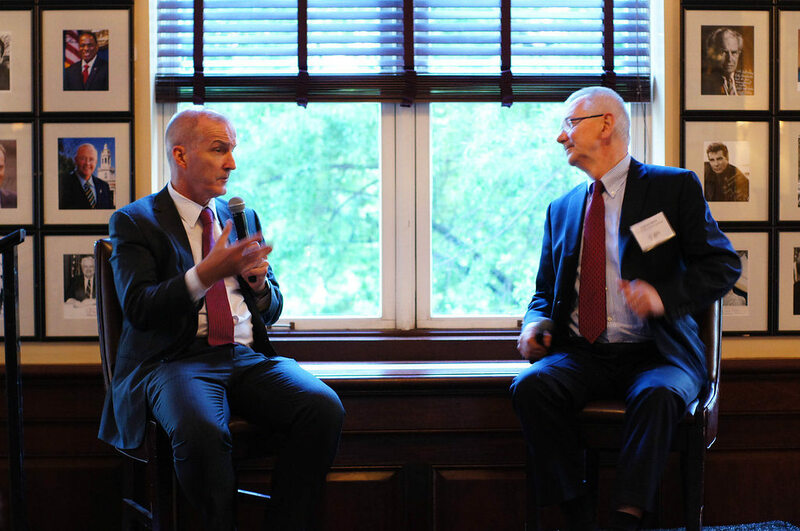 During a dinner conversation with WRI President and CEO Andrew Steer, Crane offered a blunt take on how corporations can help put the United States on a sustainable energy path. According to Crane, one of the biggest hurdles to scaling up solar and other renewables is utilities’ reluctance. They’ve built their business models on fossil fuels, and because of current grid design, consumers can’t go elsewhere. In short, the principles of the free market don’t apply to utilities. Crane envisions similar competition in other industries, such as fast food. Crane was ultimately hopeful that we’re moving toward a cleaner energy future—as evidenced by the growth of solar and electric transport—but said we need to pick up the pace. Corporations have the power to be responsive and affect change—even more quickly and efficiently than governments. That’s why Crane thinks corporate sustainability officers have the most important and exciting jobs now. “If you can find one champion [in your company], if you can get one of those people on your side, that’s good,” Crane said to the room full of sustainability officers. “There’s a huge opportunity to say within your company, ‘We have a chance to lead on this!’ As sustainability officers, we can really make an impact, so when it’s all done you can look your kids in the face and say ‘I did everything I could and we were successful."